Our Visitor Services position is the direct liaison between visitors and the Janesville community. Operating from the Visitor Information Center (VIC) off I-90 at Palmer Park, Visitor Services provides information on Janesville, Rock County, and Wisconsin. Visitor Services provides assistance to projects and programs undertaken by the Janesville Area Convention and Visitors Bureau. 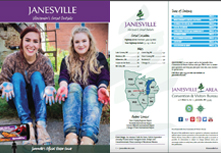 Monitor and stock brochure distribution points in the Janesville area. Must be sociable and outgoing and have the ability to maintain personal composure and tactfully handle difficult situations. Demonstrated ability to operate independently; to take initiative and to be a decision maker in assigned areas; must have good analytical skills. Availability to work as needed, holidays and weekends included. Some lifting required up to 25 lbs.